It’s no secret that the natural world holds many surprises, and this has never been more true than in the ongoing fight against cancer. As scientists and researchers study the underlying causes of cancer, searching for treatments and cures for this dreaded disease, they often find themselves turning to the very foundation of life itself – nature. The plants and herbs that are part of God’s design often hold the key to many advances in the fight against cancer. Embarrassingly, many of these plants and herbs were well known to our ancestors, and they formed the basis of many natural healing techniques. Over the centuries, as science and progress marched ever faster into the future, these healing herbs were ignored and forgotten and drugs with many side effects took their place. It is only recently that research into cancer treatments and cures have rediscovered the healing power of these herbs and plants. The latest of these recent rediscoveries is Sweet Wormwood, an herb used by the ancients to treat malaria. But recent studies are showing that Sweet Wormwood may be an even more effective treatment for a variety of different cancers. Sweet Wormwood, or to give it its Latin name – Artemisia Annua, is a plant that is native to Asia and Eastern Europe. The Chinese have used it as a healing herb going back as far as the 2nd century AD. In fact, in the 1970’s archaeologists excavating the tomb of a Han Dynasty prince found a stone tablet describing the use of Sweet Wormwood as a treatment for malaria. This sparked interest in the herb, and in its use in natural healing. 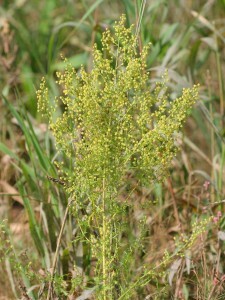 Researchers found that the extract from Sweet Wormwood, Artemisinin, was indeed a successful treatment for Malaria. This prompted scientists to explore further, and to investigate Sweet Wormwood’s other healing properties. What they found was surprising, to say the least. All cells within the body require the presence of iron for division and replication. To attract the necessary iron, cells have what are called ‘transferrin receptors’. Now, one of the fundamental characteristics of cancer is its abnormal process of cell division and replication. Cancerous cells typically divide and replicate at greater speeds than healthy cells. To accomplish this, cancer cells need greater stores of iron, and so develop a greater number of ‘transferrin receptors’. For example, breast cancer cells have 5 to 15 times more ‘transferrin receptors’ than normal healthy breast cells, and thus accumulate greater stores of iron. Researchers into the effects of Sweet Wormwood on cancer cells found that they could increase the amount of iron in cancerous cells by using a compound known as ‘Holotransferrin’. The Artemisinin extract of the Sweet Wormwood plant is a natural enemy of iron rich cells, which is why it is such a successful treatment for Malaria. Boosting the iron levels in cancer cells causes the Artemisinin to bind with the cell, halting its division and replication, and forcing it to self-destruct. The research proved that Artemisinin killed more than ¾ of the cancer cells, while leaving the healthy cells untouched. Studies into the effectiveness of Sweet Wormwood as a cancer treatment are ongoing, but the outlook is good. The research indicates that this treatment may be particularly effective for more aggressive forms of cancer, where cell division and replication is more rapid and the cancer cells will be more dependent on iron to survive and thrive. While the current research is concentrating on breast cancer, all indications point to Sweet Wormwood therapy being effective against a wider range of cancers, including pancreatic cancer and leukemia. Once again it seems that the natural world holds the answers to restoring, and maintaining, our total health. Sweet Wormwood is just the latest rediscovery that illustrates how much we have forgotten about the nature of natural healing. The plants and herbs that form the garden of God’s creation hold the secrets we need to remain healthy and cancer free.